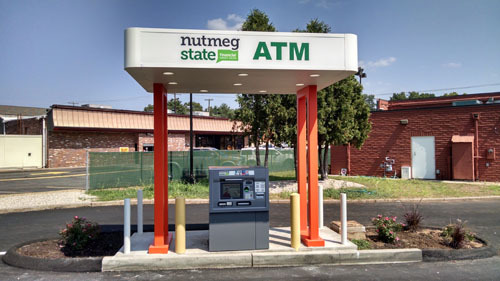 Concept Unlimited understands that, in modern banking, your ATM requires an environmentally controlled ATM kiosk that is a crucial connection to your customers. 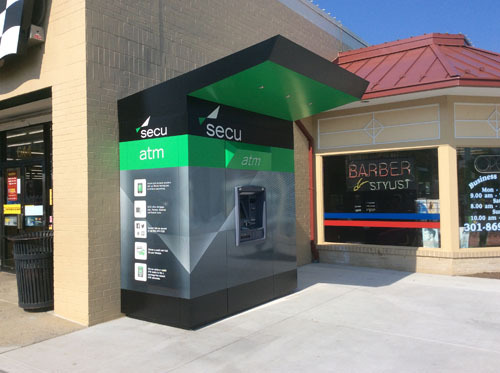 In addition to serving as a conduit for safely and efficiently replenishing funds, our custom ATM kiosks are an investment in your branding, customer service and professionalism that sets the tone for all future interactions with your customer. Browse our products below or contact us today for a custom kiosk solution. Concept Unlimited’s patented “Linear Track System” (Patent 5,806439; 5,836,256; 5,440,999; 5,611,288; 5,794,547) for ATM kiosks offers dramatic improvements in efficiency and space constraints while employing a virtually maintenance-free hand crank system. This system, when in the serviceable position, allows for full use of the width and depth of your kiosk during servicing or replenishment. Unlike our “Linear Track System,” a turntable uses 2/3 of the usable space while in their serviceable position. The simplicity of the linear track system is its greatest asset. It requires no electric motor, limit switches, or any other electric components which contribute to high maintenance issues or ATM downtime. To see the ease of use of our “Linear Track System,” please click here for a demo. All Concept Unlimited ATM kiosks are handcrafted using only the highest quality materials and craftsmanship. 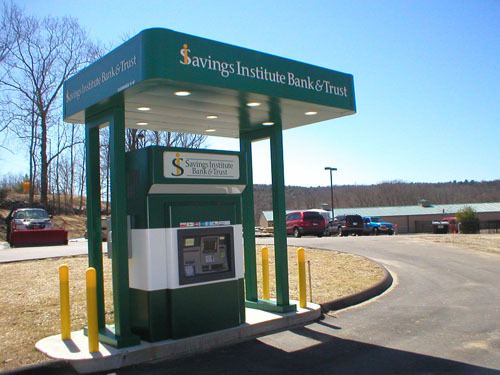 We are committed to building you a durable and inviting kiosk from the ground up, beginning with a hand welded steel frame and culminating in Matthews automotive-grade urethane paint, all crafted using modular designs to minimize replacement costs. Our start-to-finish business model means you’ll have a team of experts to manage everything from design and custom modifications to building codes and hassle-free installation.